Dan teaches beginner and intermediate guitar, piano, songwriting and voice (including harmonization) for children and adults. He has been teaching for over 15 years. Dan's approach to teaching is to instill in students the joy of creating music. Dan is mostly self-taught on both the guitar and piano and emphasizes learning by ear while also incorporating tried and true practice techniques. More than anything, Dan wants his students to learn to play with confidence, to write their own songs and to sing those songs while accompanying themselves on guitar. 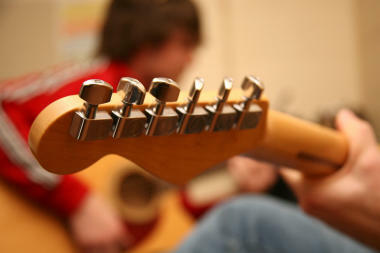 There are many teachers who will teach guitar in traditional ways. Dan teaches to each student as an individual, getting to know their interests, goals and abilities and tailoring lessons that allow each student to reach his or her potential and to love playing and singing. Dan also offers songwriting workshops. Writing and singing an original song is both art and therapy for the songwriter. It is a release of emotions, thoughts, feelings and ideas. When done well, a song can reach a listener and deeply impact their lives. Dan is an accomplished songwriter and teaches students the craft of putting words to melody, finding chord structures that meet the song's intent and building a song that resonates for the writer and for listeners. He also encourages students to perform and enjoys bringing them on stage for live performances. Dan teaches songwriting to children of all ages and to adults.